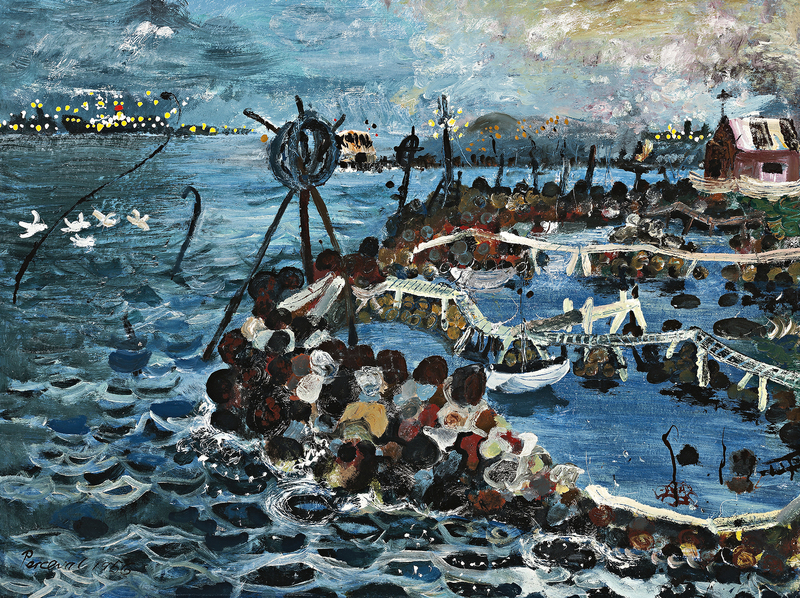 John Perceval said that the discovery of Williamstown as a subject for his painting was like finding Venice.1 A bayside suburb to the west of the city, Williamstown is Melbourne’s oldest port, a site where the Yarra River meets the sea, and it offered him a rich array of new and ever-changing subject matter. It is easy to imagine that Perceval fashioned himself as an antipodean Canaletto as he painted these pictures that vividly describe the oil tankers, tugboats, yachts and other vessels moored in the bay beside jetties and stone harbours, with buoys, marine markers, seagulls and black swans, as well as occasional human activity, punctuating the scene. Perceval first painted at Williamstown in 1956, often in the company of artist friends Charles Blackman, Arthur Boyd and Hal Hattam, driving there in a recently acquired car. The port and harbour area continued to be an important subject in his work, featuring in around thirty paintings made over the following three years. Almost a decade later he returned to Williamstown, producing a second series that was subsequently followed by another group of boat-themed pictures painted on excursions to Mordialloc to the south-east of Melbourne. The first and arguably the best Williamstown paintings were exhibited in Perceval’s solo exhibition at Australian Galleries in November 1956 – the inaugural exhibition of one of Melbourne’s first commercial galleries founded by Tam and Anne Purves. Commercially astute and with a keen eye and remarkable ability to identify burgeoning artistic talent, the Purves’s quickly established a stable of the most interesting contemporary artists. This group included Arthur Boyd, Fred Williams, John Brack and John Perceval, all of whom would in time be recognised as key figures whose work made a significant and lasting contribution to the development of twentieth century Australian art. The 1956 Australian Galleries exhibition was Perceval’s second solo exhibition and his first in eight years. It heralded a return to painting after an extended period in which ceramics had been the primary focus of his creative endeavours. In 1944 Perceval, Arthur Boyd and Peter Herbst had founded the Arthur Merric Boyd Pottery on the Boyd family property in Murrumbeena. Named after Merric Boyd – Australia’s first studio potter and Arthur’s father – they initially produced functional wares in response to war shortages and later, wonderfully original hand-painted ceramics. Painted in Perceval’s distinctive manner, Fisherman’s Sights, Williamstown depicts a section of the hand-built stone harbour, rambling white-painted timber jetties and small boats moored beside them. Although his style was expressive, his observations were precise, and details such as the small church in the distance are still visible at Williamstown today just as Perceval painted them. Within the confines of the harbour the water is calm, but in the open water of the picture’s foreground the surface is chopped up by the wind and splashing against the rocks, the blue water is edged with white foam and spray. Across the water, beyond the flying seagulls, the lights of the city sparkle in the evening sky – the welcome view of fishermen returning to the harbour with the day’s catch. The National Gallery of Victoria, Melbourne recognised the significance of these paintings, purchasing Tug Boat in a Boat for the permanent collection prior to the opening of the exhibition. In 1957, Gannets Diving, also shown in the 1956 exhibition, was awarded The John McCaughey Memorial Prize at the NGV, and the painting subsequently acquired by the Gallery. Yankee Sailing Boat – Dry Dock is in the Bendigo Art Gallery, Victoria and other closely related Williamstown paintings from the 1956 – 59 period are represented in major public collections including the National Gallery of Australia, Canberra, Queensland Art Gallery / Gallery of Modern Art, Brisbane, and TarraWarra Museum of Art, Victoria. Many others are held in important private collections, making this painting a rarity on the market. The Williamstown paintings marked a turning point in Perceval’s career and numerous successes followed: in 1959 he won the Maude Vizard-Wholohan Prize at the Art Gallery of South Australia, Adelaide and in 1960, the Wynne Prize for landscape painting at the Art Gallery of New South Wales, Sydney. His work was included in the survey exhibition Australian Painters at the Whitechapel Gallery in London in 1961 and two years later, following many of his friends and peers, including Boyd, Blackman and Sidney Nolan, Perceval and his family moved to London. His work was represented in Australian Painting at the Tate Gallery, London in 1963 and the following year he exhibited a series of landscapes, as well as a group of ceramic angels, at Zwemmer Gallery, London. In 1965, Perceval returned to Australia to take up the inaugural Creative Fellowship for an Artist at the Australian National University in Canberra, his place in the canon of twentieth century Australian art firmly established.